Actress Tak Bongkot helped Najomtien Sub-district collect cash and emergency supplies for flooding victims in Ayutthaya. The television and film star, whose real name is Bongkot Kongmalai, headlined the Sattahip sub-district’s “Do Not Abandon Each Other” campaign Oct. 14 at Pakob Market. Former Najomtien Mayor Srinuan Makmee and Pakob Market vendors came together for hard-hit residents of Phra Nakhon Sri Ayutthaya. Among the donations were four floating toilets worth 60,000 baht made by students at Sattahip Technical College after Srinuan Makmee said he was unable to find a lavatory in the flood-stricken area during a recent relief mission. Former Najomtien Mayor Srinuan Maakme and actress Tak Bongkot help residents collect supplies for flood stricken residents in Ayutthaya. Bongkot thanked all the donators saying the aid will be send to central Thailand as soon as possible. 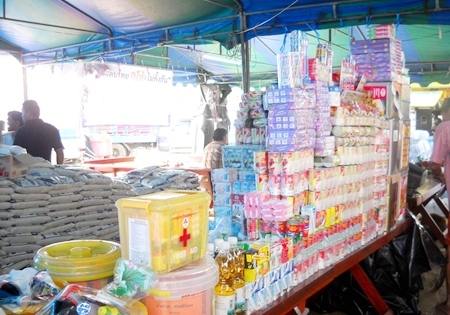 Srinuan said he and market owner Prakorb Immsomboon organized the “Do Not Abandon Each Other” drive as just one of the ways the Sattahip community was reaching out to those in need up north. 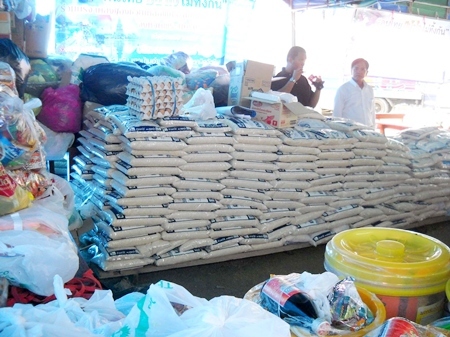 Amphur residents, for example, donated 160,000 baht cash and 18 trucks to relief efforts. He said promotion by Bongkot and other actors and radio personalities help to raise the profile of fund-raising drives.